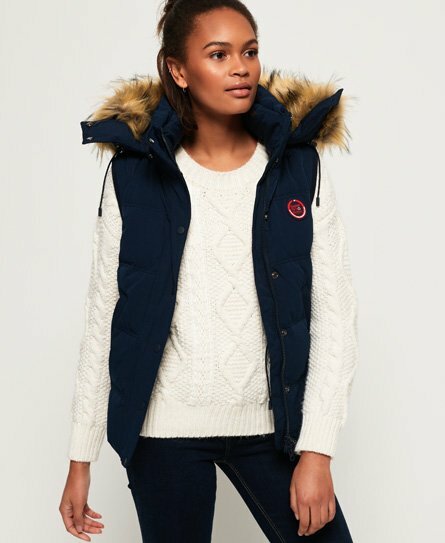 Superdry women’s Rookie down gilet. The Rookie down gilet is filled with an 80/20 premium duck down filling and provides fantastic insulation, perfect for when the temperature drops. This gilet features a detachable hood with bungee cord adjusters and a detachable faux fur trim, a double layer collar and a zip and popper fastening. The Rookie down gilet also features two front zip fastened pockets, a bungee cord adjustable waist and an elasticated panel at the back of the waist for a flattering fit. This gilet is finished with a Superdry logo badge on the chest.